Managing mental health disorders is collaborative. After diagnosis of a mental health disorder, primary care professionals play a critical role in providing information, monitoring, potential referral, support and care. Specific mental health expertise is required to develop a management plan for women with more severe symptoms. 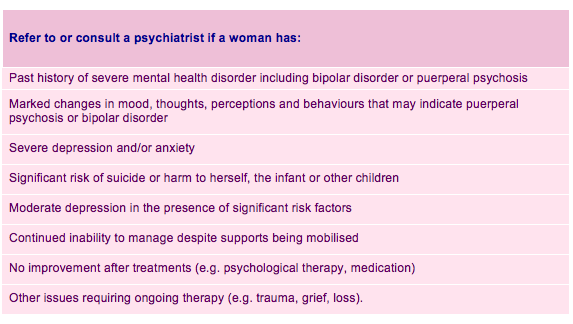 It is important to refer or consult a psychiatrist, if a woman has the following risk factors or symptomatology. The choice of treatments will depend on the woman’s disorder, her preferences and the health professional’s training, skills and experience. Relevant contextual factors include ongoing psychosocial factors, ethnicity and cultural background, age and demographic situation. To inform decision-making, women should be given relevant and culturally appropriate information about treatment options, with full discussion of their suitability and acceptability to her and her significant other(s).